About two years ago, my daughter Josie and I started a Love Is Everywhere campaign. On a walk one day, we spotted the shape of a heart in a tree and decided that it was a sign that symbols of love are everywhere, we just have to slow down to find them. We promised each other that if we ever saw a heart while we were out, we'd take a picture of it. Our hope is that after we compile enough, we will make a book one day. Not a book to publish, just a book for our family to look at together. 1. Since we have started this project, I find myself taking longer walks with our dog, slowing down and REALLY trying to notice my surroundings. I used to view walking our dog as something I HAD to do. 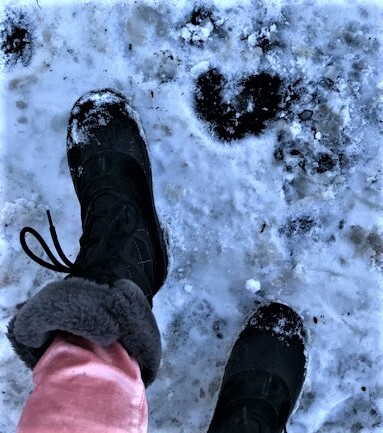 Now, I view our walks as a chance to spot more hearts. 2. I find myself feeling younger and more joyful over something that doesn't cost a dime. 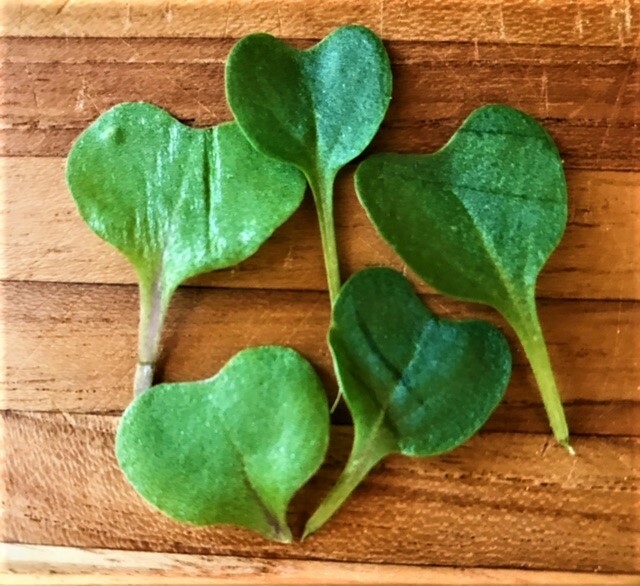 Finding a heart in nature, at the beach or in my salad greens causes a feeling of pure happiness and excitement inside of me that I haven't felt since I was a child myself. That's a good feeling! 3. I can often feel myself slowing down to look for beauty in things that I would normally pass right over and dismiss without a second glance. 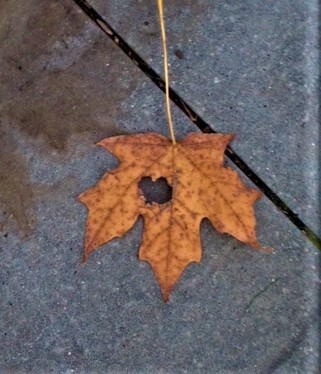 Wait, did I REALLY just see a heart in that leaf on the ground? 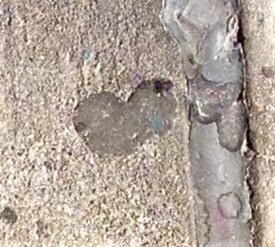 Hey, that chewed up gum on the sidewalk resembles a heart! It's an addictive habit that I am okay with. 4. When I am on the road away from my family, this project makes it a tiny bit more tolerable. If/when I see a heart around me, I take its picture and then text it to Jesse. He is able to share it with the kids and I don't seem so far away. They get excited to see the love that I see. 5. It pains me that we are living in a world where name calling, un-acceptance of others and a general sense of fear can creep into our lives if we let it. Our Love Is Everywhere campaign is a reminder to me that love REALLY is all around us. Some days, we just may have to look for it. 6. This campaign is our small way of not giving in to fear and hatred. I am not letting today's news bombard me and my family. I am not focusing on what is "wrong" with the world and the people in it. Josie and I are choosing to focus on what is beautiful and special and magical in this world. 7. Our whole family has joined in on our campaign. Zachary gets so excited when he sees hearts when he is out! 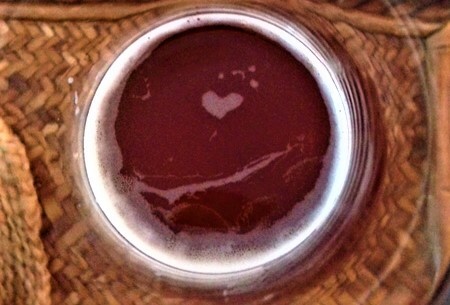 When Jesse is traveling for work, I often get random pictures of hearts texted to me. It's the best kind of love letter! Will you join us? Share your heart pictures with us (jane@onestofoods.com) and we'll post them on the blog!